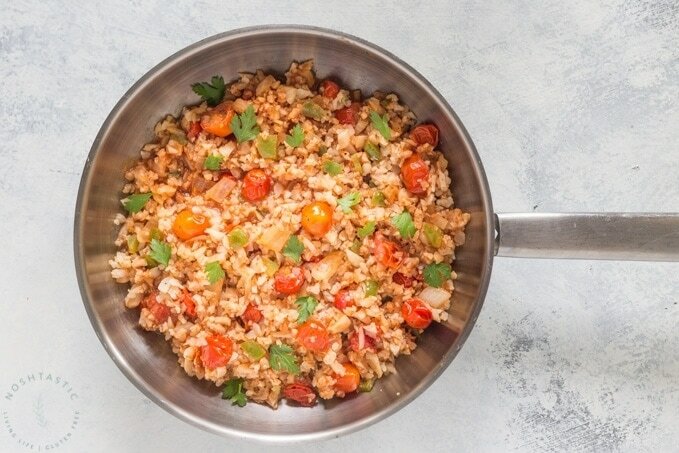 Cauliflower Mexican Rice makes a fantastic alternative to rice and comes in at only 83 calories per serving. It’s a really healthy side dish that would be perfect with some grilled chicken or fish. 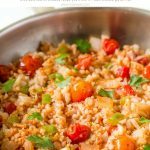 My Cauliflower Mexican Rice recipe is also packed with healthy vegetables and includes, tomatoes, garlic, onion, and bell peppers. You might be wondering what on earth is riced cauliflower? Well, it’s the latest in hipster vegetables and if you’ve not tried it you are missing out! There’s no actual rice involved, Cauliflower rice is simply cauliflower cut into tiny pieces to resemble rice and is often used as a rice substitute for people following Paleo, Whole30, or low carb diets. It doesn’t taste like rice, it’s still cauliflower after all, but if you season it well and don’t overcook it then it’s a fantastic alternative to the real thing. You can buy ready cut bags of cauliflower rice in the fresh produce and freezer sections of your grocery store, I get mine from Kroger. 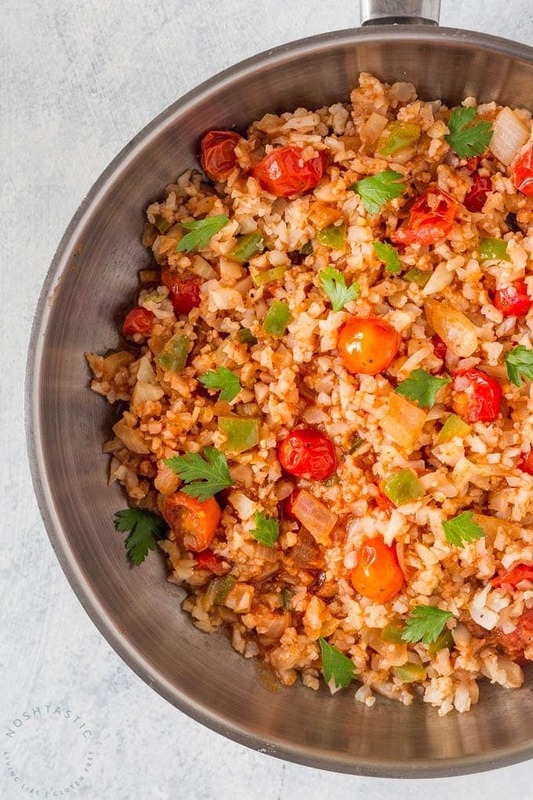 HOW DO YOU MAKE CAULIFLOWER RICE WITHOUT A FOOD PROCESSOR? You can make cauliflower rice really easily with a box grater. Just cut the cauliflower into large chunks and grate on the side with the large holes. Fair warning,it will make a huge amount of mess, or maybe that’s just me… I do have a food processor and I prefer to use it so that the mess is contained. I think it works better if you feed the cauliflower down the lid into the food processor and use the large grater disk. I’ve found that it’s less likely to turn into mush or be over processed this way than if you put it inside the bowl of the food processor with the blade. CAN I RICE CAULIFLOWER AND THEN FREEZE IT? You can freeze Cauliflower rice really easily. All you need to do is put the uncooked riced cauliflower into ziplock bags, squeeze out the air and put it into the freezer. Make sure you label the bags with the date, cauliflower should last for up to 6 months in a standard freezer. 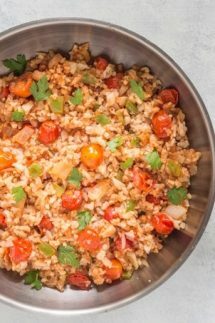 Easy and delicious, my Cauliflower Mexican Rice is the perfect low calorie, low carb, alternative to rice! Add the oil to a cast iron skillet or similar pan and saute the onion and green bell pepper for four minutes on a medium heat. Next, add the tomato paste, chicken broth, garlic, cherry tomatoes, oregano, cumin, salt & pepper and stir well. For frozen cauliflower rice follow instructions on the bag. 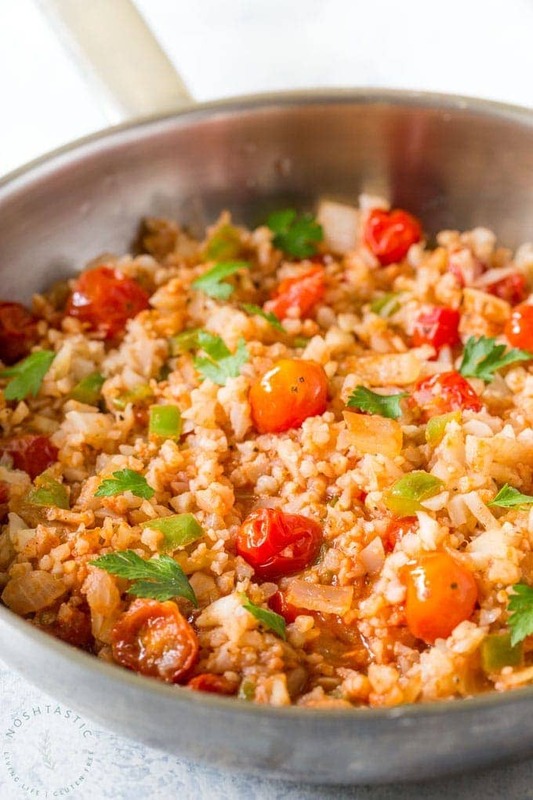 For fresh cauliflower rice, remove onion and tomato mixture from the pan. Saute cauliflower in skillet on medium heat until tender, about 5-7 minutes. Return all ingredients to skillet and stir to combine. Warm for 1 minute, garnish with cilantro and serve. CARB COUNT- If you want to lower the carbs further you can omit the onion from the recipe which would lower the carbs by about 3g per serving.